Posted: Sun Sep 02, 2012 12:47 pm Post subject: Bird control. I have lots of problems with birds in my garden. I love wildlife but birds are complete pests. The blackbirds scatter my leafmould mulch all over the paths, sparrows make dustbaths in my arid bed and root up sempervivums, swallows decimate all my whirlygig beetles on the pond and Henrietta Heron is partial to my sticklebacks for breakfast. 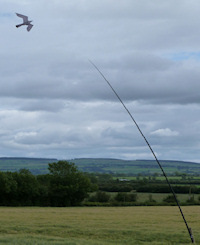 So I'm trying a solution: a hawk kite available from http://birdcontrol.ie/agricultural.shtml I bought mine from Cappaquin Co-Op. I put it up this morning and, I estimate, 40 birds rose up from my garden and disappeared into the distance. Time will tell whether it's a permanent solution. You're supposed to move it after 3 days but that's a bit of a nuisance so I'll see how effective it is leaving it in one place for a while. I'll keep you posted on how I get on with it. I read your post twice as I thought you were joking at first......but maybe you're serious. Sparrow numbers are declining, swallows will soon be flying off to S. Africa and the blackbird's song is one of the loveliest. The first time I saw this was in Lismore Castle and the people there said it worked. They had bought theirs from Cappoquin Co-Op. So off I trundled to the Co-Op, where there was one flying in the yard. Talking to someone who worked there, he said their life had been made a misery by crows who pecked open all the bags in the yard. Since the hawk had gone up a month previously, not one crow had come into the yard, although I saw quite a few of them sitting on house roof ridges outside the yard. I have mine up two days now and IT WORKS! The only problem I have so far is that the pole has telescoped down twice. I have all the sections now wound so tight to stop this that I may have a problem dismantling it in a high wind. It's recommended that Harry the Hawk doesn't fly in a Force 5 or above. I suppose in a high wind Harry would take off and keep on flying into the next county! Sive, the reason sparrows are so scarce around you is that they were all in MY garden, hundreds of them. They're probably all heading back to Wexford now. I'd come home from work and the sky would be black from birds flying around in my back garden. The destruction that all these birds caused was unbelievable. And the swallows ate ALL my Whirlygig Beetles! For some reason I have very little slugs in my garden, probably because the ground cover plants are always quivering with frogs hopping around. I probably have more frogs in this garden than I had birds. I hope Harry keeps Henrietta Heron away as well and the newts will come back. Newts are lovely but unfortunately Henrietta thought so as well. Everyone is very selective as regards wildlife. If you really wanted a garden full of wildlife then you couldn't object to rats, badgers, weasels, magpies, slugs, snails and rabbits, could you? But people do. They only want the wildlife that THEY think "looks nice." It's something similar to Vegetarians who object to killing animals for meat but will quite happily skewer a slug with a cocktail stick or cut him in half with a pair of scissors, giving him a horrible lingering death. Everyone's very selective. I'll get down off of my soapbox now. Greengage, the list price is â‚¬190.00 for the kite and the 31' telescopic fibreglass pole. I came home from work this evening and saw 3 Red Admirals in the garden. I hadn't seen any butterflies here all this summer. The swallows were probably eating them before. No swallows now and butterflies are back. Good man, Harry! No connection I think........we have lots of swallows swooping round the house and loads of butterflies that have appeared with the good weather it seems. They adore Verbena Bonariensis and I have literally dozens of Small Tortoiseshells on the flower heads. Well worth growing...and it self seeds wonderfully. Don't think Harry has anything to do with it !!! Here's piccies of Harry on patrol after I moved him today. I personally welcome any bird into our garden. I enjoy looking at the crows pulling off moss from the garage roof and even the magpies chasing the dogs away from their bones amuses me when I am washing the pots and looking out of the kitchen window. Thankfully we don't have any birds that cause damage to the vegetables or that nest in the eaves which could cause a lot of damage, especially to your nerves as the birds scratch about when you are trying to sleep. We have a couple of wood pigeons that float past occasionally and, as these produce my favourite bird noise, I enjoy them being around. I find their cooing very relaxing. Not everyone shares my enthusiasm to attract our feathered friends onto the garden, or any public space for that matter. There was a young entrepreneur in Nottingham kitted himself out with a large compressed air, pigeon-scaring machine that emitted a large bang every 60 seconds. He would set it up in the market square and eventually after a few days of constant banging, the birds would all disappear. Bear in mind that this doesn't kill the birds, it just scares them off. Therefore the pigeons would move to the next county which would pay handsomely to have them 'removed'. The birds would then fly a bit further south to the next county until eventually they went full circle back to Nottingham the following year. This man has been travelling around the midlands now for fifteen years moving this flock (and their offspring of course) from one county after another charging the taxpayers to get rid of the same birds... Why didn't I think of that? There are more and more inventive ways to keep birds away from your garden and to help me this week I have enlisted the help of Bird Control Ireland. It's not all about keeping the birds out of the garden. Many birds are beneficial so bird boxes can be placed in nearby trees making sure the holes are the correct size for the specific species you would like to attract. Huge numbers of birds are killed by striking windows each year. Reflected foliage or sky fools the birds into thinking it is safe to fly into. Try Window Alert Decal. These are sticky transfers designed to show birds that the glass is a solid object. You can choose from Butterfly, Humming Bird, Maple Leaf, Modern Square or Snowflake designs. Rooks, Magpies and Jackdaws are associated with this problem. The birds are attracted to the soft putty or silicone and keep pecking away at it causing a lot of damage. Many people get an early morning call with birds pecking windows as they fight themselves. If this is an issue, try the battery operated 'Attack Spider'. This scary device is said to chase away nuisance birds. Activated by sound, the spider drops down on an 18 inch string while making a loud noise. Then it climbs back up the string, ready to attack again. Fun for kids too I'll bet. Valuable carp collections can be decimated by Herons and Cormorants. The "Scarecrow Deterrent" will clear these raiders away with minimum fuss. The Scarecrow, shaped a bit like a water sprinkler with a face, uses a combination of sudden noise, unexpected movement, and a startling blast of water to create a memorable and unpleasant experience for the trespasser. In some urban areas, birds will land on patio tables, flat roofs or raised beds. The solar powered "Solar Bird Repeller" is a useful device that will humanely clear the birds away. The two adjustable "arms" cover up to 5ft in diameter by turning continuously at 30 RPM's. A solar panel powers a heavy duty, brushless motor which will store energy. The Solar Bird Repeller is portable, and can store energy to keep it lasting into the night. Using something called the 'Repeller Ribbon', similar to an unwound video tape but thicker and more colourful, will stop birds from eating and pecking away at fruit. This is a bright flashing, holographic tape fixed just above the bed or in through the bush is very good at keeping many small birds at bay. A bit like fairground balloons with clown faces, these Bird Chaser Balloons will frighten birds immediately. Made of durable vinyl, the Bird Chaser is effective when used in a variety of outdoor locations such as home orchards and gardens, berry patches, decks and patios. The Galaxy Spinner workes by spinning action contains holographic strips that reflect in the wind. The visual deterrent scares birds off. There are a couple of products suitable for larger areas and effective enough for farms. This device will keep birds off Bales, Crops, Maize/Silage Pits and Pasture. It is suitable for crows, Pigeons, Geese and Gulls. This is a Self-Launching Kite with 10m heavy duty telescopic pole. It is easy to set up and use and can protect up to ten acres. Simply erect the pole and the kite will fly in the breeze scaring away any pesky birds. This comes at a price though and you won't get much change out of â‚¬190, but it is getting great reviews although you will need to move it every day and take it down if the wind gets above 30mph. There are also one shot bird scarers and scarecrows that emit bird distress calls to make a hostile environment. The latter are solar powered so you can move them anywhere. There are also bird wires, bird proof netting and bird spikes to stop them settling on window ledges. If birds are a real problem for you and you would like to find out more visit - birdcontrol.ie. Personally humans upset me an awful lot more than any bird ! Yes but, Sive, if you planted 80 cyclamens and blackbirds ate 77 of them, would'nt you be annoyed? I wouldn't mind if they ate 10% of them but to demolish virtually the whole crop is a bit much. I'm not getting at you but when birds get out of hand, then control measures are needed. Harry doesn't harm any birds. He just gives them a "virtual" taste of their own medicine. I've been out on my boat at Skellig Michael and seen gannets decimate a whole shoal of fish. Remember, birds are direct descendants of dinosaurs. Just because they are "nice looking" doesn't mean they are virtuous. Dragonflies and Mayflies have to live too. Mind you, our blackbirds have enjoyed our raspberries more than we have this year ! As for gannets being virtuous or not, I'm not at all sentimental or mushy about animals and birds, I merely think we are a horribly greedy and destructive species and seem to think we have the right to do what we want with all other living creatures. With our so-called superior intelligence I just feel we could do better than we are doing.